The universe is our vast, complex and mysterious home. Science has discovered a lot about it, including how it grew from the initial big bang to what we see today. But how it started remains a mystery. Was it God, or did it have no cause, or has it always existed? Fifty years ago, many scientists thought it possible that the universe had always existed. The two main theories were “steady state” (the continual creation of matter at the centre of an expanding universe so the universe appears the same for all time) and “pulsating” (the universe goes through regular cycles of expansion and contraction for all time). However these theories are no longer believed by most scientists, and it is generally considered “proven” that the universe we inhabit began about 14 billion years ago with the “big bang”. However many aspects are still being worked out, and here I outline the most accepted understanding at present. In the big bang, all the matter, energy, space and time which we can observe were apparently created in an instant. Initially concentrated in a very small point (see note 1, below), the universe expanded outwards rapidly with enormous energy. This was not like an explosion into empty space, but expansion of space itself. In the first fractions of a second, when current laws of physics did not apply, a lot happened. Within a small fraction of a nano second, the universe expanded at an enormous rate from a very small size. This is known as ‘inflation’, and was necessary to allow the universe to be relatively homogenous (i.e. everywhere you look, it is much the same). Particles began to form out of the enormous energy – first small particles like quarks, gluons and leptons, later the more familiar protons, neutrons and electrons. The four fundamental forces or interactions (gravity, electromagnetism, the strong nuclear force and the weak nuclear force) developed gradually, because scientists believe that these forces are actually caused by an exchange of very small particles (bosons). By the time the universe was 1 second old, it had expanded to a size about a thousand times the size of our solar system, and the temperature dropped to about ten thousand million degrees. As the age of the universe moved beyond seconds to minutes, and it grew in size to about 1015 kilometres across, nuclear fusion formed the first of the nuclei we know about today – Hydrogen and Helium – in proportions that proved necessary for the universe as we know it to form. The universe was still incredibly hot. After several hundred thousand years, conditions had stabilised enough for the first atoms to form; after several hundred million years, the first stars, and later the first galaxies, began to form by gravitational attraction. Supernova stars created many of the heavier elements out of the lighter elements, and then exploded them out into space, making them available for planets which later formed, thus allowing the complexity of chemistry on earth necessary for life. 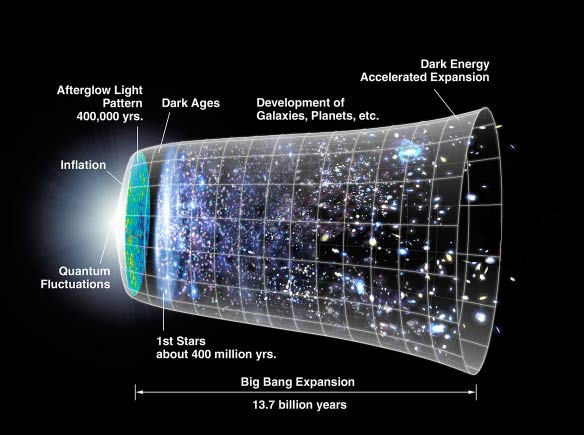 The universe is still expanding today, and scientists are able to (a) extrapolate backwards and describe the early moments of the big bang mathematically, (b) predict outcomes of their theory which can be verified by observation of the universe, and (c) show mathematically that the alternative theories have significant flaws. 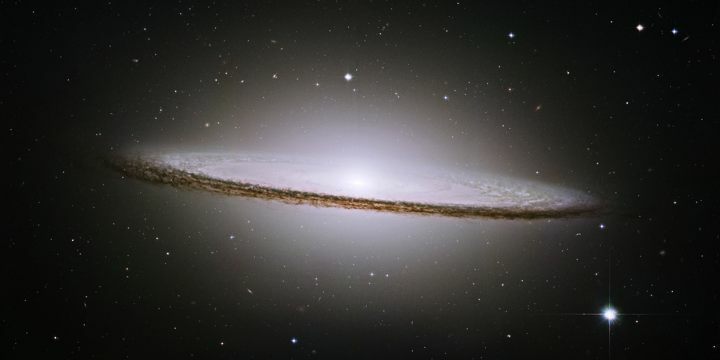 Thus it has been demonstrated that the big bang origin is almost certain. 3. the universe never began because it has always existed. Option 1 seems to be the most obvious choice. For most people, this implies a god of some sort, but some believe our universe could have resulted from a previous universe. However this simply pushes back the problem, and we still have to find an explanation for the entire chain of universes. Option 3, with the corollary that something that has always existed doesn’t need a cause, was once a popular choice. The demise of the steady state theory of the universe and the evidence for the big bang virtually rule this out. Some people combine options 1 & 3, and suggest that there have been an infinite series of universes, leading eventually to our present universe. But this idea still doesn’t explain why these universes exist. Also, we know scientifically that physical processes gradually “run down” according to the Second Law of Thermodynamics, and in infinite time, all physical process would have run their course and everything would be in a static homogenous state. Since this isn’t the case in the universe, matter and physical process could not be infinite. Does God’s existence explain anything? Some people argue that if God can exist without an explanation, then why can’t the universe? God’s existence then wouldn’t explain anything. But if God exists and is timeless, and the universe clearly isn’t, then his existence may explain everything better, even if it doesn’t provide a scientific explanation. For a more detailed discussion of the arguments around whether God is the best explanation of the universe, see The Cosmological argument. So we have three main options. Either (i) a powerful god, who has always existed and therefore doesn’t have or need a cause, created the universe for some purpose, or (ii) there has been an eternal succession of universes giving birth to later universes, or (iii) there is no god, matter is all there is, and for reasons we are unable to explain, and probably never will, the universe appeared at the big bang. All three may seem unlikely, but the universe is here, so one of them must be true. Each view has its supporters, but none can be proven or disproven. Each of us can decide. I believe that creation by God is more reasonable than either of the other options – what do you think? Scientists cannot observe the big bang, so they have to rely on mathematical models to understand what probably happened. These models cannot tell us whether the universe is finite (in which case the whole universe began in that one very small point) or infinite (in which case only the part we can see was concentrated in that point). But if there was and is more than we can observe, we cannot know. The models can only be extrapolated back so far, and then they reach what is known in mathematics as a “singularity”, where the size of the universe is infinitely small and the density infinitely large, and the maths can go no further. Main photo: NASA. Second graphic: SNAP. Take an in-depth look at the philosophical argument based on the facts about the universe, in The cosmological argument. Possible explanations for the fundamental universal laws which appear to be finely tuned to allow life, in Was the universe designed for us? Check out the scientific evidence for the apparent fine-tuning of the universe, in Science and the design of the universe . Our Earth is just right for life, but is this anything remarkable? Look at the scientists’ assessments in A rare earth? The big bang explained in more detail by The European Space Agency, NASA, The University of Michigan and Wikipedia. “Just Six Numbers.” by Martin Rees (1999). The philosophical argments: the first cause argument and the design argument. William Lane Craig on why the universe exists. Various viewpoints on the Cosmological Argument.